Homeschool Day at the Capitol in Georgia began in 1997, when the Georgia homeschooling community responded to a huge legislative threat in the form of HB586. GHEA and TeenPact, under the direction of Tim Echols, teamed up to organize the first Homeschool Day at the Capitol. In only 10 days, the event was planned and included classes, homeschool student musical and other performances, support groups displaying posters and photos of their activities, and children playing chess. Over 4,000 people, a record that remains today, attended for the largest single day event in Georgia Capitol history. Homeschool Day at the Capitol has been held every year since 1997 during the legislative session that runs January through March. What Happens at Homeschool Day at the Capitol? Homeschoolers across the state of Georgia gather to meet and thank our legislators for the work that they do for our communities throughout the year. This has given legislators and their staff the opportunity to see “real” homeschoolers in action, rather than making assumptions based on media-hyped stereotypes. Through the years, this annual event has led to countless coalitions being built with members of our government that share our vision and has softened many who had been previously opposed to our style of education. Homeschool Day at the Capitol has developed into a full day of learning and activities, while still achieving our goals of exposure to and gratitude for our public servants. We conduct Capitol tours throughout the day and hold classes on topics such as the legislative process (how a bill becomes a law) and the judicial system, all in a fun environment! Make plans now to join us for Homeschool Day at the Capitol at your beautiful Georgia state Capitol in downtown Atlanta! 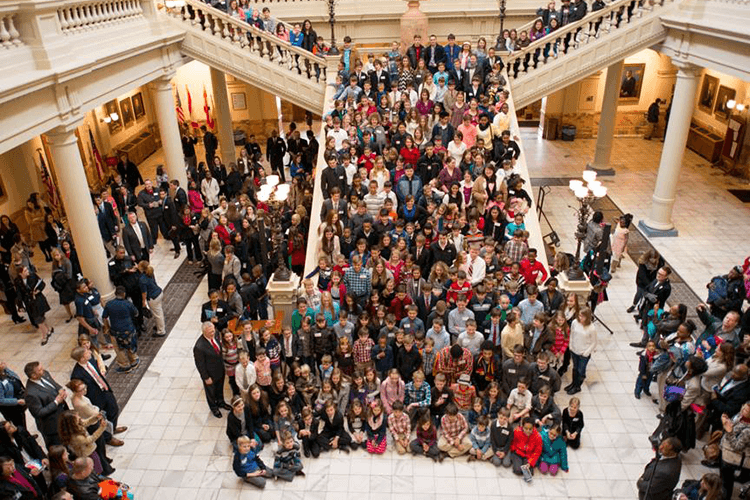 2019 Homeschool Day at the Capitol – Wednesday, March 6, 2019! © Copyright 2018 Georgia Home Education Association. All rights reserved.